My second card was made using the eCraft Dolls and Pets sd card. What a lot of fun these are. Took me back to my childhood days of paper dolls. 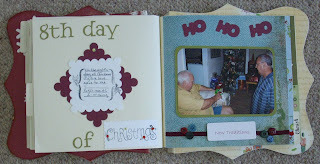 I also added a touch of red to this card for a bit of bling and added a Spellbinders tag. My swap partner is a passionate cat lover so the eCraft Dolls and Pets sd card provided the perfect image for this card. We had our fortnightly Create and Chat over at Craft Mad on Friday night.We made a Cake and Candle card. This card is adaptable to any occasion. 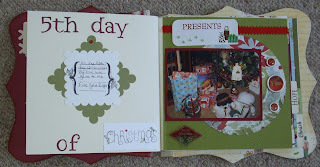 I made a birthday and a Christmas card in this style. We hold our Create and Chat online at Craft Mad every second Friday Why not sign up and join us for a night of Creating and Chatting. 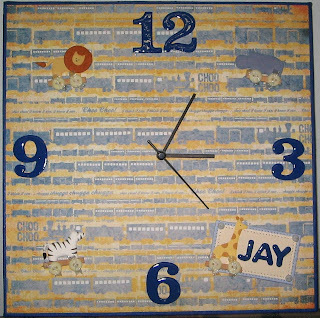 My last clock was made for my great nephew Jay. I painted the canvas blue added some cute train paper and animal embellishents. 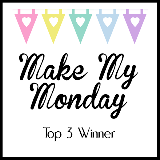 Thank you for visiting my blog this week and I hope that you have enjoyed your time here. Please call back soon. 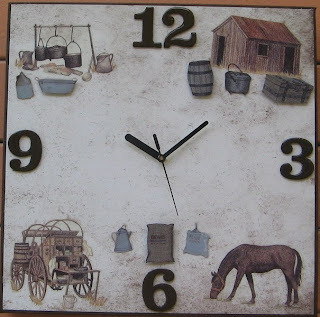 I covered this canvas with patterned paper and added 3d images of horses and farm equipment for my friends birthday clock. 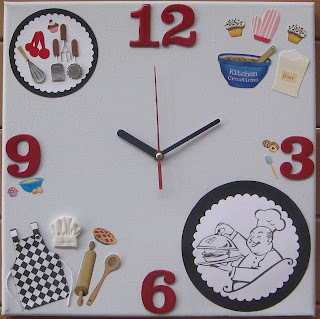 A clock for my daughter who is a chef. I painted the canvas white to highlight the colours in the numbers and the embellishments. I also used a digital image of a chef. Unfortunately I can't recall the original site to give credit for the image. 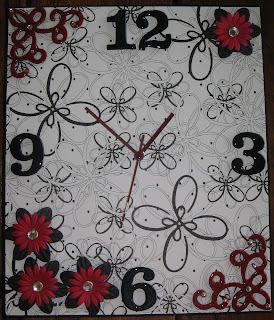 I made this clock for my craft room , using my favourite colours, black and white with just a touch of red added. This week I thought I would share some of the clocks I have made using canvases. 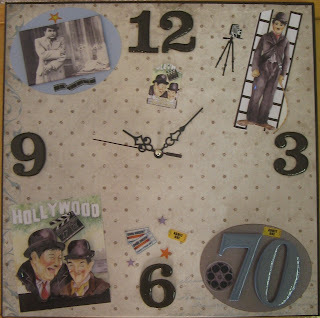 Today's clock is movie themed, with James Cagney, Charlie Chaplin and Abbot and Costello. I made it for Ron who is a bit of a movie buff. I have used a 6x6 square card , added a layer of patterned paper, Spellbinders Lotus Pendant and Spellbinders circle dies and topped them with a Studio Light 3D image, added a ribbon rhinestones and a greeting. 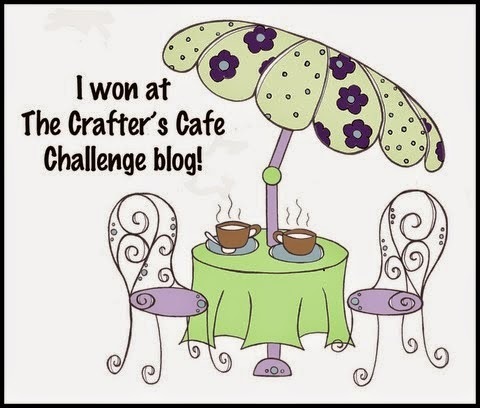 Thank you for visiting my blog this week.I hope you have enjoyed seeing my creations and will come back soon. Blue Edge Crafts have some new Cheery Lynn dies in store.. I made these cards with the Big Weaver die. I think they make an interesting background on a card . Our July Card swap at Craft Mad has been completed. We had a tic tac toe theme this month and had to choose 3 techniques to make our cards. I chose Embossing , die cuts and flowers for my first card . and glitter pearls and flowers for my second. 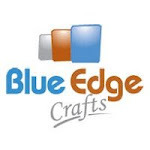 I hope you have enjoyed what I have done and perhaps picked up a few ideas All the Laser Cut Card Fronts are available from Blue Edge Crafts Please call back soon. I really had a play with this next card . I faux stitched and coloured the pots plants, inked the edges and chalked the background, added a tag and butterfly. I stitched this card and added bazzill layers behind the card front and added some pearls. I have added a layer of black bazzill under the laser cut card front and a self adhesive felt image to the centre. I covered the existing hearts with punched hearts and then some rhinestones around the edges and gold stickers to the corners. I then faux stitched the pattern around the edge of the card front. I loved the laser cut on the front of this card. 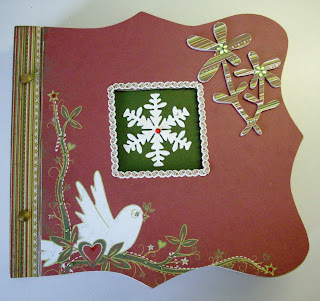 I added a Spellbinders Fleur de lis die cut and a Studio Light 3d image to the centre. The background is red bazzill. 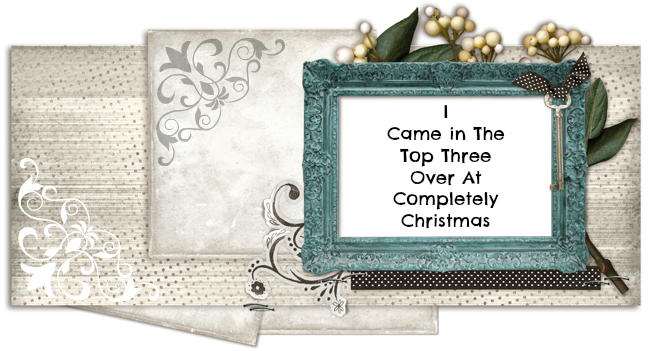 This one has a layer of pink bazzill, a Studio Light 3d image and pearls added. These cards are also beautiful when stitched but I have tried to show an alternative to those who prefer not to stitch. Today I would like to show you some lovely hand made cards I received for my birthday last week. I just love the colours in the flowers on this one made by my sister in law Ruth . 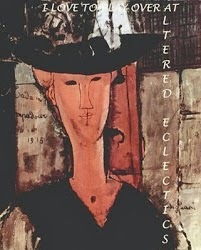 Stunning card . 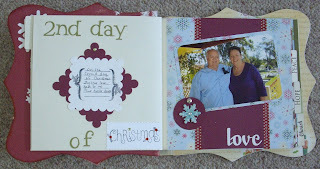 I hope you have enjoyed looking at my Christmas journal this week and you will visit my blog again very soon. Day Two , Three and Four. The bonus Technique Theme is Spirelli I have used Blue Edge Crafts Combo paper formy card , added Spellbinders Octagonal nd Pennant dies. The bike is from Scrapmatts and the greeting is from Sticker Store. 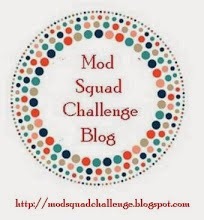 Due to graphic technology any entry with a graphic image will be subject to the Design Teams discretion and we will contact you if feel the entry does not meet the ethos of our challenge blog. This is not meant to take the fun out of the challenge at all. However, we also have some fun news. 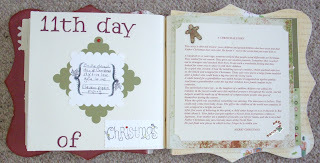 Christmas in July seems to be gaining popularity so I thought this week I would share my 12 Days Of Christmas journal. I made this journal as part of a Christmas workshop.